When you apply a filter in Photoshop Elements, you’re presented with a gargantuan dialog box. This editing window is called the Filter Gallery. You can also access it by choosing Filter→Filter Gallery. In the flexible Filter Gallery, you can apply multiple filters, tweak their order, as well as edit them ad nauseum. Choose Filter→Filter Gallery in either Edit Full or Edit Quick mode. The Filter Gallery editing window appears. Apply and edit multiple filters in the Filter Gallery. In the center of the editing window, click your desired filter category folder. The folder expands and shows the filters in that category. A thumbnail displays each filter’s effect. You get a dynamic preview of your image on the left side of the dialog box. To preview a different filter, select it. Use the magnification controls to zoom in and out of the preview. To hide the Filter menu and get a larger preview box, click the arrow to the left of the OK button. Specify any settings associated with the filter. When you’re happy with the results, click OK to apply the filter and close the editing window. If you want to apply another filter, click the New Effect Layer button at the bottom of the editing window. This step duplicates the existing filter. Choose your desired new filter, which then replaces the duplicate in the Applied Filters area of the dialog box. 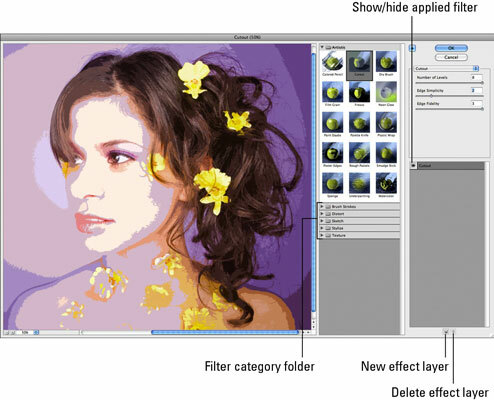 Each filter you apply is displayed in the lower-right area of the Filter Gallery dialog box. To delete a filter, select it and click the Delete Effect Layer button. To edit a filter’s settings, select it from the list and make any changes. Keep in mind that when you edit a filter’s settings, the edit may affect the look of any subsequent filters you’ve applied. Finally, you can rearrange the order of the applied filters. Doing so changes the overall effect, however. When you’re completely done, click OK to apply the filters and close the editing window.